First, the chart for the approximate time of the signing of the executive order itself. North Node in Virgo on the IC: practical means for bolstering the homeland. North-Node on the IC is the classic "cultural conservative" signature and appears on the natal horoscopes of Pat Buchanan and Vladimir Putin. 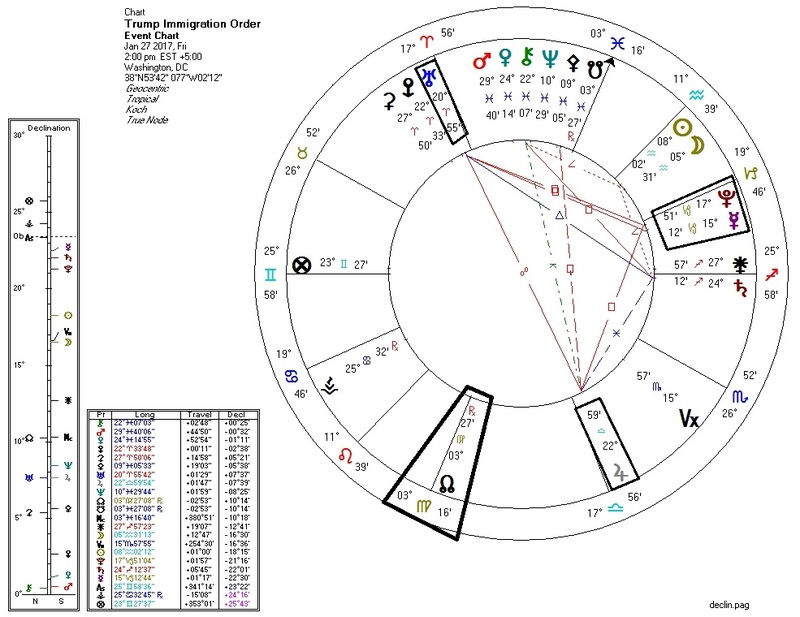 T-square with Uranus in Aries (active disruption) opposite Jupiter in Libra (foreigners, "others"), bisected by Mercury and Pluto in Capricorn (the voice of power/authority). Saturn on the Descendant in Sagittarius: restriction of "others". Apollonian: Pallas semisextile Sun and ruled by Jupiter which is square Mercury. An unclear signature on the libertarian-to-authoritarian spectrum. The restriction of movement is an authoritarian action, but doing so to plausibly reduce the risk of domestic violence and save lives is arguably rational. 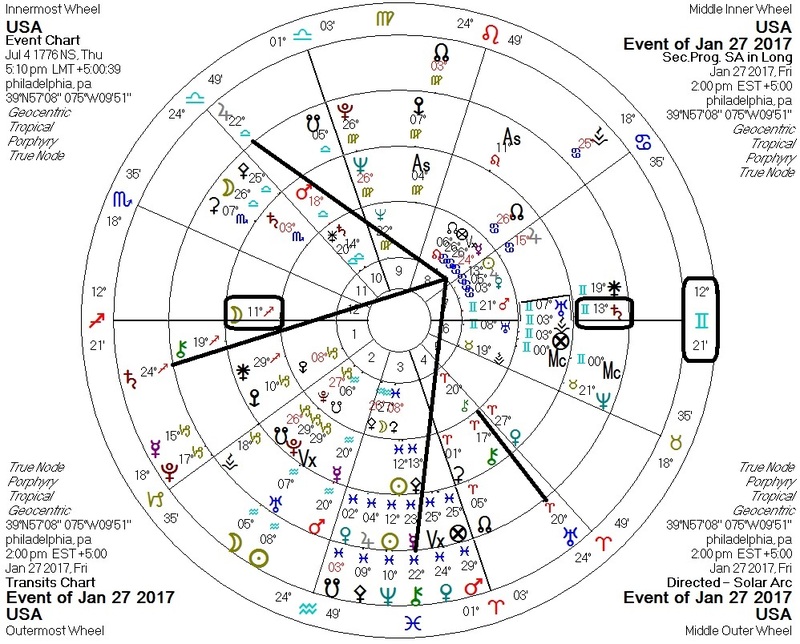 Jupiter (populism), Saturn (restriction/authority), and Chiron (adjustment) all in aspect to US Mercury (ruler of Seventh House of "others"). Progressed Moon in Sagittarius on Ascendant: spotlight on foreign (Sagittarius) peoples (Moon). Solar arc Saturn on Descendant: restriction (Saturn) of others (Descendant). My own reaction is one of uneasy (as I feel towards all restrictive government action) approval (because the action can reasonably be argued to reduce US domestic terror risk).